Join the game day action at UW Madison football games by volunteering at or visiting the RISE Brat Stand at UW Madison Football home games! The RISE Brat Stand is located at 1337 Regent St. (corner of Regent & Randall) and proceeds benefit RISE programs and the children, families, and individuals we serve through care coordination, early childhood home visiting and education, and respite care. 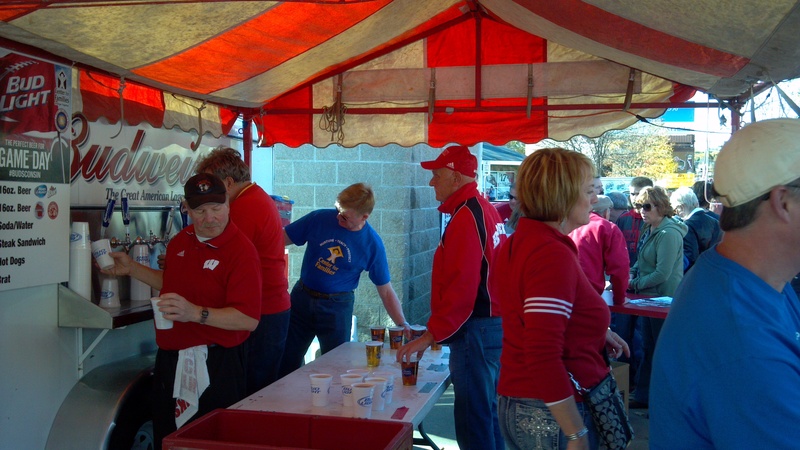 The Brat Stand serves brats, burgers, steak sandwiches, chips, soda, water, and beer before, during, and after each home game (excluding night games). The success of this stand is the result of dedicated volunteers! Volunteer activities include gatekeeping and checking ID’s at the Brat Stand entrance, set up, tear down, grilling, serving beverages and food, taking orders, and handling cash. Please note, because alcohol is being sold, children under age 18 are not allowed to volunteer during serving hours, but could assist with set up and tear down of the Brat Stand. If you’re interested in learning more about the RISE Brat Stand or signing up for volunteer shifts, visit our sign up page.